Portugal has enticed more and more travelers in recent years, and no wonder -- it’s affordable, it’s adventurous, and it’s absolutely gorgeous. Most first-time visitors focus on the capital, Lisbon, so for better or worse, other areas have remained somewhat sheltered. That’s changing now. Lisbon continues to be fantastic (and still a relatively under-visited European city) but if you’re thinking about traveling to Portugal, you should be thinking about Porto. The country’s second largest city is a long-time Lisbon rival. The difference between the two is probably most tidily summed up in the nicknames of their citizens: people from Porto are tripeiros, meaning tripe-eaters; Lisboans are alfacinhas, meaning little lettuces. Tripe, for those of you who have thus far led disappointing lives, refers to the filling, cheap, unpretentious stomach lining of (usually) sheep or cows; little lettuce refers to lettuce that is small. The idea here is that Porto is a working-class town while Lisbon is ~fashion~. 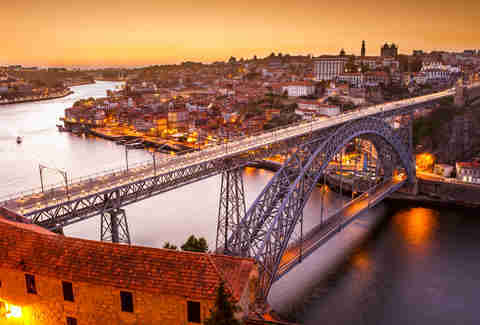 Porto is generally a more budget-friendly destination even than Lisbon, and you’re in luck if you’re coming from around Newark -- United Airlines recently launched the first direct route from the US to Porto, out of the NJ/NYC airport. Otherwise, you’ll have to fly into a larger European hub and transfer from there -- this might cost a little more upfront, but your day-to-day budget will be lower than in the big-hitting European capitals. If you can, plan your visit for late spring or early autumn, when the weather is at its most lovely and the tourists are at their most… elsewhere. 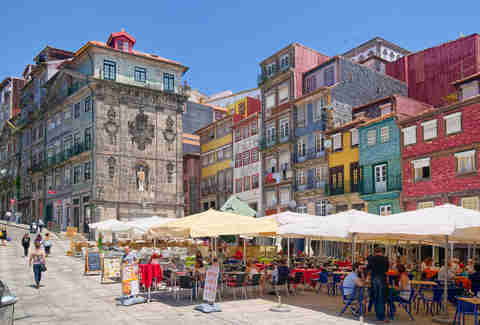 Porto gives you as much cobbled-street charm and dazzling ancient architecture as you’ll get anywhere else in Europe, and it’s nestled in one of the world’s leading wine regions -- yet it’s still affordable and uncrowded. And right now, it’s more accessible, exciting, and alive than ever before. The sea breeze will probably have you wanting to spend as much of your day outside as possible. Many of Portugal’s best secret beaches are a few hours’ drive south, and by all means, rent a car and hit them up. 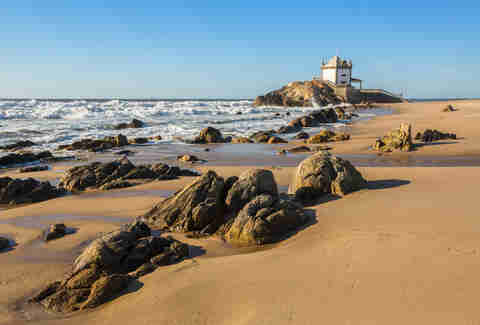 But there’s also a whole other lineup of beaches beloved by locals, like Praia de Matosinhos, that sit just a few minutes from Porto’s city center by public transport. 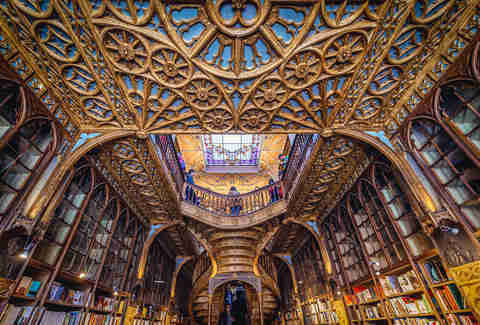 When you need a break from the sun, stop in at Livraria Lello -- J.K. Rowling once taught English in Porto, and this is the bookstore that inspired Hogwarts. It’s more of a place to take selfies now than to actually buy books, but the winding staircases that await you inside are exquisite. When darkness falls, it’s time to explore Porto’s rapidly evolving bar and nightlife scene. Set aside time for Capela Incomum -- a 16th-century chapel converted into a wine bar. To take in the view of the city center, head to rooftop pub Guindalense near the Dom Luis I Bridge (Gustave Eiffel’s other great creation). If you’re looking to bar-hop, make your way to the Rua Galeria de Paris, one of the city’s nightlife hubs. Try Xico Queijo if you want dinner and conversation; Cafe au Lait if you want dancing. Portuguese people also seem to have fewer hang-ups, by which I mean zero hang-ups, about combining drinks in a way that un-fun Americans might deem tacky. This is how you’ll end up drinking such concoctions as port and Red Bull. Or at the very least port and tonic. Don’t worry, we’ll get to all things port in just a minute. The food and nightlife might be increasingly modernizing, but Porto’s aesthetic remains distinctly Old World, with steep cobbled streets, red-tiled roofs, and intricate Baroque churches. The city gets much of its character from Spain and North Africa -- the signature azulejo blue tiles, which you’ll see adorning many of the buildings, have Moorish roots. It’s also one of the best places in Europe to see medieval architecture; Portugal stayed neutral during World War II and was never bombed, so you’ll find that the sorts of fortresses you’re used to seeing only as ruins are still intact. Some might even be repurposed into, say, wine cellars… or port cellars, more specifically. 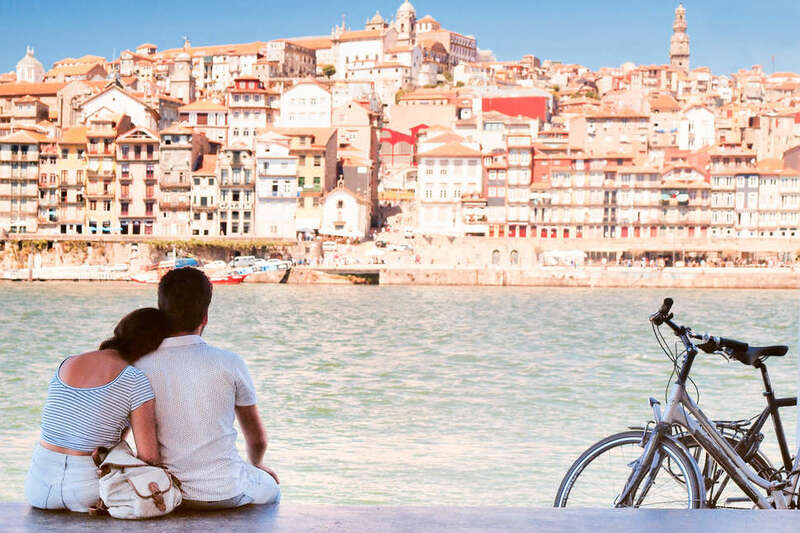 Take a Douro River Cruise, or hit the bike trails across the wine terraces in the Douro Valley, if you want to be more active for some reason. This is the oldest wine-producing region in the country (there aren’t many that pre-date it in the world), singular enough to be recognized as a UNESCO World Heritage Site. Quinta da Roêda will set you up with a flawless tour and generous port-tasting, and the venue is just bananas to look at -- rolling hills covered with vines, olive trees, and poppies. If you visit in harvest season (September or early October) you can do some old-school grape-treading -- stomping the grapes barefoot in a traditional lagar, or giant stone basin. So decadent and hedonistic -- primal, almost -- is this experience you’ll feel like you shouldn’t be allowed to do it, but you are, and you do it whilst drinking and singing folk songs so bring friends. On the coast, take a morning to walk through Viana do Castelo. Here you’ll find probably the most beautiful architecture anywhere in northern Portugal, including the strikingly white Santuário de Santa Luzia church, which I can only assume the architects were trying to make visible from outer space. And look, you’re right near Braga -- the country’s oldest town, often referred to as the “Portuguese Rome” because it can trace its origins back that far. There’s also epic canyoning at Serra da Freita. If you want to jump off the mainland, you should look to Madeira, an adventure paradise and one of the most beautiful island vacations you can take right now. If even thinking about all this sounds like a bit much on a belly full of port, you might like something more sedate, like the hot-air balloon rides over the plains of Alentejo. Kind of surprisingly, Portugal’s also got some seriously rad wildlife -- head inland to Ponte de Lima, a farming hub famous for its green wine (referring to age, not color) and hike into the mountains to see wild horses. You may have been whale watching, but I will bet good money (in, like, journalist terms, don’t get excited) that you’ve not been wolf watching (maybe just in Yellowstone) Drive about an hour northeast from downtown Porto into Parque Nacional do Gerês for a nighttime tour where you’ll look (and listen) for the Iberian wolf, an endangered subspecies of which there are only 300 left in the country. This is practical advice for saving money, but the trouble is that the appetizers in question -- gizzards, charcuterie, mussels, octopus and multiple types of bread -- are very, very good. Fish Fixe (say ‘fish fish’) is an especially good stop for this in Porto; ordinarily, I’d say it’s too close to the main tourist drag, but their second-story view of the River Douro is just so charming. For serious seafood -- where the catch-of-the-day is laid out on ice -- go to Os Luisadas. You must save room for dessert, but I really don’t know how anyone manages that, so please write me if you do. As far as eating-outdoors-with-a-view goes, DOC Restaurant on the river in the Douro region is tough to beat. And yes, you should eat Porto’s signature dish. Tripas à moda do Porto contains cow’s foot, pig’s ear, white beans and, of course, tripe; basically it’s exactly the kind of dish Anthony Bourdain would have wanted you to eat. Try it at A Cozinha do Manel. Get cinnamon-covered pineapple (don’t ask questions, just do it). 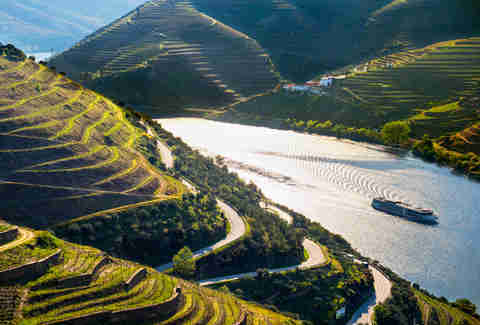 The Douro Valley is also known for its olive oil, so don’t sleep on that while you’re there. Not that anyone would let you, the stuff’ll be drizzled up and down something or other at every meal. And if you look closely enough you’ll see a decorative sardine at bars, restaurants and bars around the country -- it’s a beloved (and delicious) national emblem. I’m sure many of you picked this up a while ago, but when we talk about Portugal and Porto, we’re talking about port. You should drink port here. You might know only the deep ruby drink (still good!) but here especially you should try white port. It’s also made from grapes but tastes like honey that makes you tipsy. When you tour a port cellar -- try Ferreira Cellars in downtown Porto -- the barrels smell like they’re full of honey, but honey that lowers your inhibitions. And this is somehow the cheapest of the three varieties (the other two being the more familiar ruby and tawny). There are no hard rules about tipping in Portugal -- it’s normal to leave a bit extra if you want to, but not compulsory the way it is in the States. One of the blessings of this country is that you can get luxury accommodations for what in the States gets you, like, the third largest room at the Best Western. In the center of Porto, you can do no better than the legendary and recently reopened Hotel Infante Sagres. Rooms start around $200, which is fairly modest for a place that’s has hosted everyone from Bob Dylan to the Dalai Lama. Don’t worry, we meant it when we said Porto was affordable. You don’t have to stay somewhere fancy even if you have the coin; there are still budget hostels here. Porto Lounge Hostel & Guesthouse -- steps away from the Tourist Information Center -- has free breakfast and rooms that can drop down into the $30s. Same goes for Nice Way Porto Hostel, which comes with the added benefit of a cocktail bar. Rooms at Oporto City Hostel can drop even cheaper -- check out the easiest ways to find deals with these handy travel apps. In Ponte de Lima, anyone with an active Instagram account will lose their mind over Carmo’s Boutique Hotel, an intimate, lavishly decorated retreat with a spa, restaurant, wine atelier, and views of rolling hills of wildflowers (another perk of going in late spring); rooms dip to about $220 in the off-season. In Amarante, look for Casa da Calçada, where rooms can drop under $200 per night, too. This was my personal favorite for the view of the River Tâmega alone. The port and tonics were nice, too.